Biryani is one of the most famous dishes that has come down to us from the kitchens of the Mughal Emperors. Being artistic in nature, the Mughals looked on cooking as an art. It was brought to South Asia by travelers and merchants. There are many stories about the origin of biryani but this is the one that I like best! It is said that when Mumtaz Mahal (the beloved empress of Shah Jahan, and in whose memory the Taj Mahal was built) paid a visit to the Indian army barracks she found the soldiers weak and undernourished. She asked the chef to prepare a dish that combined both meat and rice which would provide a balance of rich nutrition and protein and “biryani” was born. Biryani is a rice based dish made with a blend of aromatic spices and a choice of chicken, mutton, fish, beef, eggs or vegetables. There are many varieties of biryanis and different ways of preparing it. I thought we would start with a basic egg biryani recipe and then slowly graduate to the more complex biryani recipes. In this recipe we use “potli ka masala,” which is the Indian version of a “bouquet garni.” It is unlike a bouquet garni in that the spices are tied in a muslin cloth with a piece of string and used in the cooking process. It is then discarded before the dish is finally completed. The potli ka masala used to make different kinds of biryani contain over 20 aromatic herbs and spices and can be bought in a well stocked Indian or Pakistani grocery store. For this simple egg biryani, I put seven spices in a small piece of cheese cloth and tied the mouth with a piece of string. I used it to infuse flavor to the boiling water in which the rice was cooked. The list of ingredients may seem long and the directions lengthy, but try this recipe and I am sure you will be pleased with the results. Place the eggs in a saucepan and add enough cold water to cover them. When the water comes to a boil, immediately turn off the heat. Cover with a lid, and let the eggs sit in the pan for 15 minutes. Remove the eggs from the pan and put them in a bowl. Allow to rest for two minutes and when the eggs are cool enough to handle, remove and discard the shell. Slice each egg in half and set aside. Heat ghee in a large, wide, heavy-bottomed pot over medium-high heat. Add star anise, mace, cinnamon, cardamom and let the spices infuse the ghee with their essence for one minute. Next, add onion and salt and fry until the onion turns light brown. Add ginger-garlic paste, and green chillies. Cook until the raw smell disappears. Then add the turmeric, chillie cumin, coriander, and garam masala powder. Fry for one minute and add the tomatoes. Cook until the oil separates from the tomato mixture. Add the yoghurt, cilantro, and mint. Stir well. Add the egg halves and mix gently so that the eggs stay intact and are well coated with the tomato mixture. Cover and set aside until the rice is ready. You will use this pot to create the layers for the biryani. In a small piece of cheese cloth add bay leaf, green cardamoms, black cardamoms, cloves, pepper, cinnamon and marathi mogga. Tie it up with a small piece of string. This bundle of spices will be used to flavor the water in which the rice is cooked. Wash the rice and soak it for 15-20 minutes. Drain the water completely. Add eight cups of fresh water to a large pot. Add salt, ghee, caraway seeds, and the potli ka masala. Place the pot over medium-high heat and bring the water to a boil. Let the water boil for two minutes. Then turn the heat to medium so the water comes to a simmer. Add the drained rice, stir gently and let the rice simmer for 10-12 minutes. Check by pressing a couple of grains of rice between your thumb and forefinger to see if it is cooked. If you find it still has a hard, grainy center, cook for another minute or two. The rice will continue to cook when you are draining it and also when you layer the rice with the egg masala in the next step. Switch off the flame and drain the rice in a colander. Discard the potli ka masala. Gently fluff the rice with a fork. Put the saffron strands into a small bowl, add the warm milk and stir gently. Put the orange food color in another small bowl and add two teaspoons of water to dissolve it. Set aside. Take half the egg masala out of the heavy-bottomed pot and keep it in a bowl. Put half the cooked rice over the egg masala that is in the pot. Scatter one tablespoon of cilantro, a few bits of mint and half the fried onions over the rice. Sprinkle half the garam masala powder, and dribble a little saffron milk and a few drops of orange food color over the rice. Arrange the rest of the egg masala over this and add the remaining rice. Sprinkle the rest of the cilantro, mint, fried onion, and garam masala. And finally dribble the rest of the saffron milk and orange food color. Lastly pour melted ghee over the layered egg biryani. Cover the pot with a tight fitting lid and place it over medium heat. When you see the steam escaping, reduce the heat to low and cook for ten minutes. This is an easy egg dish to make when you have guests for breakfast or brunch. The recipe is so versatile, you can add just about any ingredient you fancy and it makes an impressive main dish or side for your table. In fact, the combination of eggs, grated potatoes, and cheese, makes this an all-in-one full breakfast. Add some blueberry pancakes, and you can skip the trip the your local diner! If you try this recipe with a combination of ingredients that you love, please share the recipe with me and the rest your fellow readers. Grease a nine-inch pie dish. Preheat oven to 350 degrees F (175 degrees C). Heat butter in a skillet over medium-high heat. Add potato, leek, and jalapeno. Stir and cook for about eight minutes, until potatoes are softened. Cool for a few minutes and then spread evenly on the bottom of the pie dish. You can even do this a day ahead. Cover with a saran wrap and keep refrigerated until you are ready to make the frittata. In a large bowl beat eggs, mozzarella cheese, Parmesan-Reggiano cheese, salt, and pepper. Pour egg mixture over the potato, leek and jalapeno mixture. Bake for 25-30 minutes. Test to make sure that the eggs are set and the top is golden brown. Garnish each slice with a leek knot as seen in the picture. 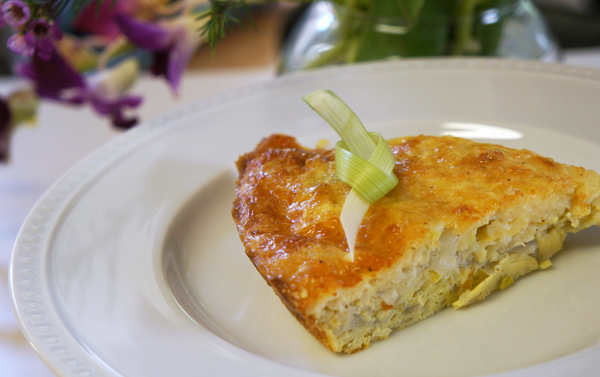 This frittata makes a beautiful dish for brunch.